Windows store is plagued by VLC Media player rip-offs and copies. If you search for VLC in store for example, you find several that use the official name and logo, but are not the real deal. To make matters worse, some of them are not free. Videolan, the parent company of VLC Media Player, has been working on a port to Windows 8 for some time now after a Kickstarter campaign was successfully funded for that purpose. 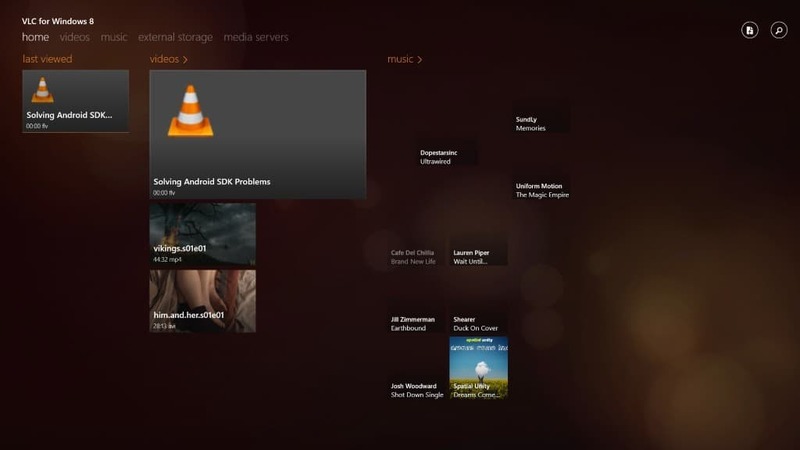 Today, VLC for Windows 8 was launched to the store. Please note that the app may not be returned as the first hit when you search for VLC, or even for its full name, as other apps such as "Play from VLC", or "Video Player for VLC" are displayed first on the store. So how good is the media player for Windows 8, and who is it for? VLC has been released as an application, which means that Windows RT users can install it on their systems as well. Windows 8 users, those who use desktop systems, always had the option to install VLC regularly on their system and use it. Windows RT users are therefor the target audience of the app. That does not mean that Windows 8 users won't be using the app as well, especially if a touch-screen is being used, or if the full screen approach or the automatic recognition of new video and music files, make it more convenient to use. The makers label VLC Media Player for Windows 8 beta right now. When you first start the app after installation, you will notice that it will scan your video and music folder automatically, and add any media files it finds in those folders to its library. This looks either great or not so great depending on the state of your music and video collection. As you can see on the app screenshot above, the music that VLC discovered looks a bit of a mess in the interface due to missing album covers. Thumbnails for some videos are created automatically, while this is not the case for other formats such as flv. That does not mean that VLC won't play those formats though. According to the product description, VLC for Windows 8 players "every kind of video" including mkv and flv, and also audio which includes mp3, off and flac for example. The interface displays a menu at the top which you can use to switch between the home screen, video and music pages, a page for external storage devices, and one for media servers. As far as settings go, there are not any right now. This can be an issue, as you cannot add other paths on your system to VLC so that they are scanned for video files. While you can configure the system to open VLC when you click on media files, it is inconvenient to only use the videos and music folders for the program's library feature. I guess you can work around that issue using symbolic links, but to make things simpler, an option to add other paths to scan should be included in the final version. As you would expect it, the video player launches any files you open in it in full screen mode. A basic control panel is displayed to you on start but is hidden after a couple of seconds. You can bring it back up when you click with the left mouse button. It offers basic controls: you can stop playback, jump back or forth using buttons or the timeline slider at the bottom, or increase or decrease the video speed. Here you can also open a subtitle file, or go back to the main interface. It is a convenient system and works quite well actually. A couple of controls are missing though. There is no mute or volume change option for example, and I could not figure out how to switch audio tracks if a video supports more than one. 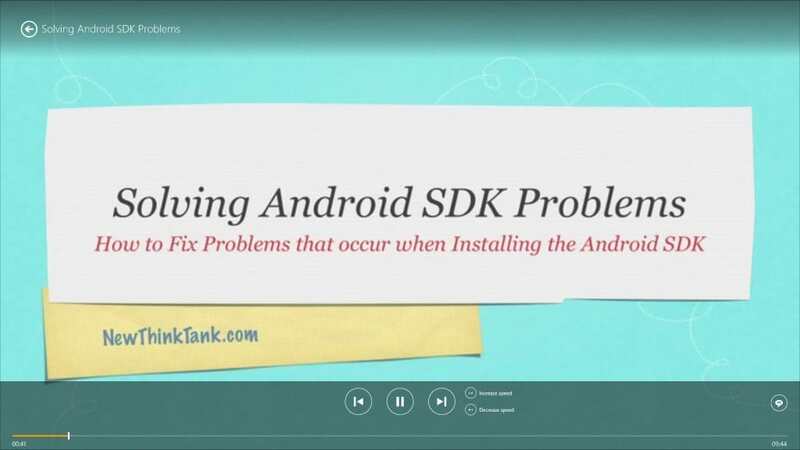 While full screen may be a good choice, depending on the video that you play and the screen resolution of your Windows device, it may not look as good depending on those factors. If you play a low res video in full screen, it may not be a pleasant experience. You can snap the app to either side of the screen to improve this though, but it is far from ideal. The music player is basic. It plays music right on the main screen of VLC though, and does not switch to full screen. It only features a timeline and pause button, but no volume controls or other controls. It is also interesting to note that I encountered a bug while using the player. Music was initially discovered by the player, but when I opened it again, all the music was not listed there anymore, and I could not figure out a way to repopulate it. The release of VLC for Windows 8 is a good thing, do not get me wrong. Especially for Windows RT users, and to a lesser extend for "regular" Windows 8 users as well. The app has room for improvement though. What I would like to see is an option to add other folders on your computer to the media library, preferences to configure the player's behavior, and improvements to the media player itself. The post The real VLC for Windows 8 has been released appeared first on gHacks Technology News.